Craftsman Evolv compressor blowing air so slow with no pressure. You are here: Home / Craftsman Evolv compressor blowing air so slow with no pressure. 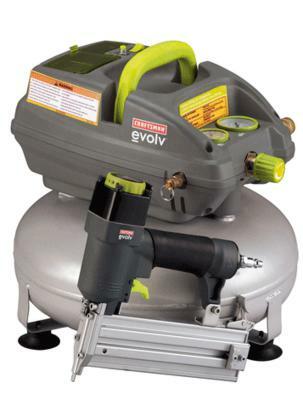 I have a pancake 3 gallon oil-less craftsman Evolv compressor. It’s about 3 or 4 years old. It does turn on and motor runs and fills tank to 110 psi. When I connect it to tire to inflate it does not have any pressure pushing air out of tank. I have drained tank of any water moisture, and released all air from tank, replaced tire connector but still does not work properly. Please tell me what it could be, it is very frustrating, I can even pump air faster by hand than this compressor can. Thank you for your help. From what you’ve written I would suspect that the problem is that your regulator is pooched. I now with this style of air compressor it’s hard to get at, but you will need to get the shroud off, pull the air regulator, put the discharge coupler where the regulator is plumbed, and see if you get full pressure air out of the tire chuck. I think you will. Then, since you do want to regulate the air pressure down to the minimum operating pressure of any tool, you will want to replace the regulator if, when you plumb in the discharge coupling where the regulator is – basically taking the regulator out of the circuit – you do get full compressed air flow.